Everyone at Signature Car Hire is excited about the launch of the new 2019 Range Rover Evoque. This new generation of Land Rover’s ever popular compact SUV has seen some exciting improvements, a fresh new look hybrid technology to achieve greater efficiency and to bring it more in line with its brother the Velar. This is in addition extended room in the cabin and a bigger boot which Evoque enthusiasts have been calling for. It also now only comes available as a five-door SUV. Design director at land Rover, Gerry McGovern, commented on the new Evoque that the SUV’s looks are “meant to be unmistakably Evoque, while being unmistakably the new Evoque”. Land Rover has kept the clamshell bonnet and bulging front wheel arches in addition to the ultra-slim rear glass area which we welcome. Design improvements include flush door handles and a less fussy surface to the doors, with none of the horizontal creases of the original, much in homage to the Velar once more. 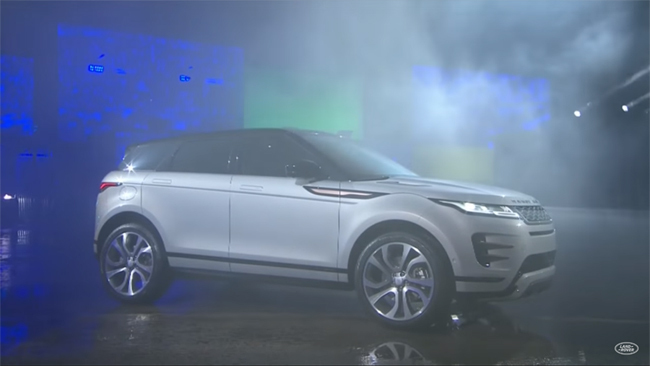 This is the Evoque all grown up, with increased wheel sizes ranging from 17 inches up to an optional 21 inches. Whether you select diesel or petrol, the Evoque comes with a 48-volt mild hybrid system equipped with an 8Ah lithium-ion battery. Rather than waiting for the vehicle to come to a stop, the system cuts the engine off completely below 17kph and uses a belt-integrated starter generator to help with acceleration when needed. The electric device also helps to reduce turbo lag and overcomes any delay in stop-start activity which, according to. Land Rover, the MHEV system alone brings up to a six per cent reduction in fuel consumption, saving as much as 8g/km of CO2 emissions. You’ll be spoilt for choice when it comes to the engines. The new Evoque comes with all Ingenium four-cylinder units. The petrol engines produce 197bhp, 247bhp and 296bhp, while the diesel engines have 148bhp, 178bhp and 237bhp. Land Rover says the new Evoque is more capable off road compared to its predecessor; the new generation has a wading depth of 600mm, up from 500mm, and it gets Terrain Response 2, tech from the full-sized Range Rover that detects the road surface and adjusts the transmission accordingly. Neat! Clever gadgets that you can expect include Clearsight Groundview, previously only seen on the Discovery, which uses cameras on the side mirrors and the front axle to show a ‘through-the-bonnet’ view on the car’s upper infotainment screen. The interior has clearly been influenced by the Velar, with a 12.3-inch digital instrument panel, the option of a head-up display and a pair of 10-inch infotainment screens on top-end versions. Well done land Rover, you’ve done it again!